...In that year the Bieth and their minions (Ar-Rahman curse them!) swarmed out of Qasr al-Malik and over the surrounding regions of the plains. The Bieth set to work binding a jinn of salt and flame to use against the walls of Jeradda, but as soon as the rite was finished and the jinn bound, a small group of soldiers broke through the lines. The sorceror (may he rot) binding the jinn was slain by an arrow and recieved his just punishment. The jinn then turned upon its binders and laid waste to the Bieth encampments, but both it and the soldiers were annihilated. Unsure on source; looks like DiTerlizzi? 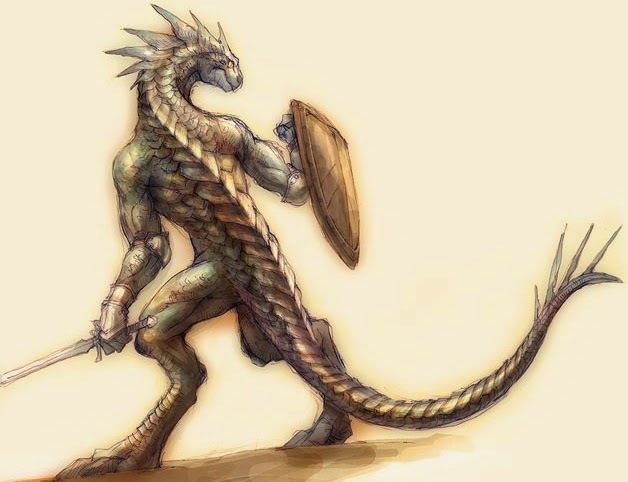 Among the horrendous sorceror-king checklists of the Bieth was "conduct weird biomancy experiments," including the creation of a warrior race, fusing together the reptilian nature of their dragon steeds and the humanoid nature of their subjects. These creations were designed to be the equivalent of NCOs - guiding the slave races to fight in the cause of the Bieth. After creating these "dragon-born," the Bieth slapped control helmets on them and sent them out to enforce their reign of terror. Now, a few millennia after the disappearance of the Bieth, a few of their dragon-born servitors are starting to awaken from their stasis chambers, make their ways to towns and the like. A few are even taking up the religions of the people around them, filling the void in religious belief since their wicked god-kings abandoned them. Iron Hide: The dragonborn cannot gain any benefits from wearing armor. Instead, their scales harden and provide protection as they age. Natural AC 6 (plus any Dex or shield bonus) which improves to AC 5 at level 4, and AC 4 at level 8. Dragon Breath: once per day, plus once more for each 4 hit dice (up to 3/day), may breathe fire, cold, lightning, acid, poison, or sonic blast in a 30' cone. It takes one hour to recover the energy to use this breath again. The blast deals 1d4 damage, increasing to 2d4 at 4th level and 3d4 at 8th level. Save for half damage. 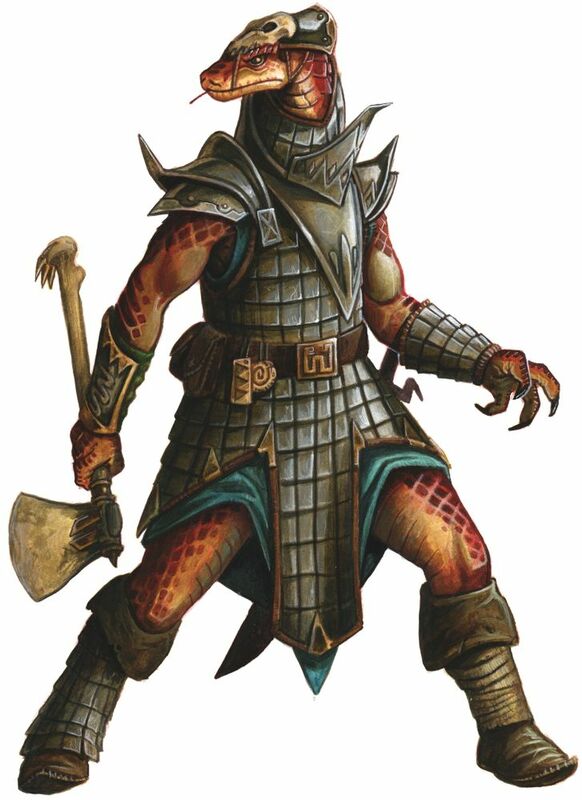 Battlefield Healer: A dragonborn may give of its vitality to aid a comrade (or master, originally). A dragonborn may expend a use of its breath weapon to instead heal one individual. For every 2 HP that the dragonborn sacrificies, the individual can regain 1 HP. Champion: The imposing presence of the dragonborn provides all allies within 10' +1 to hit. At level 4, this becomes +1 to hit and +1 to damage. At level 8, the dragonborn may, 1x/combat, give up its action to grant another action to someone else (cannot be used for spellcasting). Servant of the Bieth: The dragonborn may be targeted by any magic or magical effect that was designed to target the Bieth. It is at Disadvantage for all saves while in the Zone. The dragonborn may roll against Int or Wis (whichever's higher) on 4d6 to decipher Bieth script, and can potentially be recognized as an authority figure by other creations of the Bieth. Vat-Grown: The dragonborn is immune to non-magical disease.